Charles Augustus Lindbergh. American pioneer aviator. The first man to fly solo accross the Atlantic. Autograph signature on menu card. 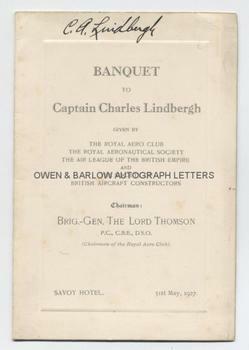 The menu card for a "Banquet to Captain Charles Lindbergh given by the Royal Aero Club, the Royal Aeronautical Society, the Air League of the British Empire and the Society of British Aircraft Constructors. Chairman: The Brig-Gen The Lord Thomson. Savoy Hotel. 31st May, 1927." On heavy folding card with Toast List and Menu printed inside. Signed by Charles Lindbergh with a good, clear, bold signature at head of front cover. On embossed and engraved card measuring approx 9.5 x 7 inches (4.75 x 7 inches when folded). Fine. Charles Lindbergh, then an unknown U.S. mail pilot and aged only 25, achieved meteoric fame when he bacame the first man to fly solo accross the Atlantic Ocean on May 20th-21st, 1927. His Ryan monoplane, Spirit of St. Louis, took off from Roosevelt Field, Long Island and landed at Le Bourget, Paris. After his landing in Paris, Linbergh was recieved by cheering crowds everywhere he went. After flying briefly to Brussels (where he was received by the King and Queen of the Belgians), he flew the Spirit of St Louis to Croydon aerodrome, near London. After making his aeroplane ready to be shipped back to America, Lindbergh attended 10 Downing Street as guest of Prime Minister Stanley Baldwin. He then had an audience with the King at Buckingham Palace and was presented to the Prince of Wales at York House. 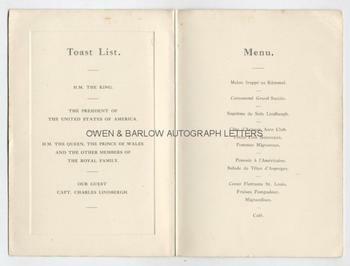 He attended the House of Commons as guest of Lord and Lady Astor and, in the evening, attended a banquet at the Savoy Hotel, held in his honour by the Aero Club of Great Britiain, of which this is the menu card. 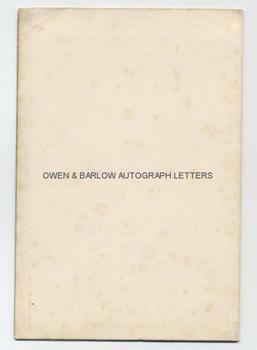 A pleasing and desirable item, as it was signed so soon after the historic flight (10 days later) and whilst he was being feted on his dizzying round of engagements. Charles Linbergh's autograph has always been in demand but is a comparative rarity. He was an intensely private man who did not court publicity and his reluctance to sign autographs was greatly increased after the kidnapping of his infant son, apparently because he feared his signature falling into the wrong hands.